Ulrich Ostergaard in action against Lakeside. Ulrich Ostergaard admitted his comeback went much better than he dared to imagine after helping Panthers cement their position at the top of the SGB Championship. 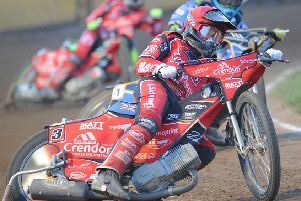 The Danish racer top-scored with a dozen points in a top-of-the-table triumph against Lakeside last Friday night. The pacesetting Panthers beat their closest challengers 52-38 to extend their advantage at the second-tier summit to four points. Lakeside do still boast two meetings in hand. Ostergaard, who escaped with whiplash and concussion from a frightening crash only 12 days earlier, said: “I had a practice in Denmark during the week and I felt a lot better on the bike than I thought I would after such a big crash. “That’s why I made myself available. I was still a bit stiff and I didn’t expect to be able to race as well or score as many points as I did. “Getting the win in my first ride back gave my confidence a boost. I had Richard Lawson, who is a really good gater, on my inside so it was pleasing to beat him and that set me up for the rest of the night. “To finish with 12 points is really pleasing and it was important to beat Lakeside as we want to keep our position at the top of the table. It’s a good achievement to be there. We’ve got a great team spirit and everyone has been performing better than a lot of people expected. Panthers are now past the halfway stage of their league campaign having completed 11 of 20 fixtures – and it could hardly have gone much better. Owner Ged Rathbone said: “We’ve been guilty of making slow starts in previous seasons and we knew we couldn’t afford to do that again with so few fixtures this year. Panthers burst back into action with three home meetings in the space of two days this month. They entertain Scunthorpe in a league clash next Friday (July 13) before hosting Lakeside in the first leg of a KO Cup quarter-final and reigning champions Shefffield in the league on Sunday, July 15.